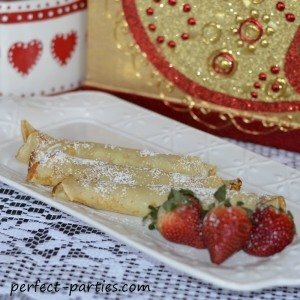 Crepes are a great breakfast treat for slumber parties! Just add your favorite filling such as jelly, peanut butter, nutella and dust a sprinkle of powdered sugar or fill with fresh fruit and add a dab of cool whip on top. We also tried it rolled up with pancake syrup. You can even make it the night before and refrigerate for a ready to make breakfast the next morning. This recipe serves 8 so double for a large group. We ate 2-3 each. Fillings such as jelly or jam, peanut butter, nutella, fresh or frozen fruit. In a large bowl mix eggs, milk, water, melted butter and vanilla. In a smaller bowl add sifted flour, salt, and granulated sugar. Gradually add the flour mixture to the wet ingredients and mix well until smooth. Heat a 9 inch non stick pan on medium high heat. Spray with non stick spray. Pour 1/4 cup of batter tilting pan as you pour in a circular motion to spread evenly. See tip suggestion below. Cook for about 2 minutes until bottom is slightly browned and flip over and cook for about a minute. For best tasting crepes, serve immediately!! Add your favorite filling and dust some powdered sugar on top. One recommendation I read, was to let the batter set for 30 minutes before cooking. I believe it is to let all the flavors meld together. We didn't wait and they were still excellent. This batter can be made the night before and refrigerated. It will keep for two days. If it separates, just gently whisk and use. I added a couple tablespoons of milk to make it a slightly thinner consistency. It makes a thinner crepe. Some people add water instead. I added a tiny dab of butter before making each one but you can just spray your pan every so often. If you don't mind waiting, eating the crepes as they come out of the pan taste the best. The edges are slightly crispy which makes it have a nice texture. The first time I made a stack and held it in the microwave which kept it warm but the edges lost the crispiness and has a more "rubbery" texture. Girls LOVED it with the crispy edges and ate 3 each! I lifted the pan from the heat and poured the batter in a ring and tilted it until it was "filled" in. Cook the first side slightly longer than when you flip. We used a small Spice Sifter Spoon and spoon to sprinkle the powdered sugar on top.